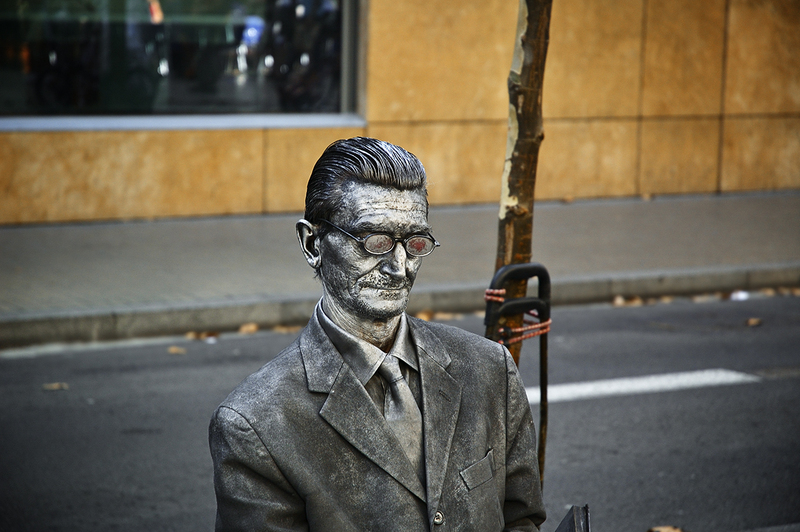 This is another shot of a street artist, a human statue that appeared in Barcelona Photoblog a long time ago: Seasoned Human Statue Sitting in Las Ramblas. Seasoned because of that weather beaten look he has. His previous photography didn't show the suit too much so I thought you would also like to see this one. Very nice picture. I like the first one too. O que é que eu posso dizer mais, para alem de um obrigado por continuares a deixar-me cheio de saudades das Ramblas. I am just so amazed at how good these artists are! The makeup, the clothing, their demeanor. . . . . I didn't see this guy when we were there. I wish I had! Love the picture! Does he make money doing that, or does he do it just for fun?